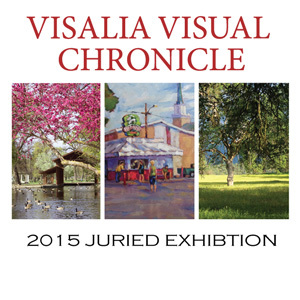 Arts Visalia is proud to partner with the Arts Consortium in hosting the 2015 Visalia Visual Chronicle exhibition, a juried competition intended to locate artworks for acquisition to a permanent, public collection held by the Arts Consortium, a non-profit 501(c)(3) organization that connects creativity, community and culture in Tulare County, California and acts as the strategic local partner of the California Arts Council. Established in June of 2011, the Visalia Visual Chronicle is a permanent public collection of artworks which celebrate the people, places and culture of Visalia and it’s surrounding region. Established in 2011, the Visalia Visual Chronicle was originally developed by local arts writer and curator Aaron Collins and is now under the stewardship of the Arts Consortium, with whom Arts Visalia has partnered in organizing and presenting the exhibition. The Arts Consortium seeks donations to support the purchase of these artwork candidates and, to date, six artworks have been acquired for the collection which could one day become a part a yet-to-be-conceived museum or cultural center of Visalia. The exhibition will be on display at Arts Visalia April 1st through April 24th, 2015, after which time the artworks will be on moved on a rotating basis to other public venues over the next two years. An opening reception will be held at Arts Visalia on Friday, April 3rd from 6:00 to 8:00 p.m. Admission is free and open to the public.